Before there was Jesus, there was vending machine. That's right, vending machine. It might seem like a modern idea, but the first vending machine actually dates back to approximately 200 B.C. It was around that time that Hero of Alexandria, a Greek mathematician and prolific inventor, wrote about the earliest known vending machine in his book about pneumatics, the science about the mechanical properties of gases. The machine was designed to distribute holy water for the price of a silver coin. According to Hero, when a coin was dropped through the slot on top of the vessel, it would hit a lever that unplugged a hole to let the water flow out the side. When the coin fell off the lever, the hole would close again and the water would stop flowing. Whether Hero actually invented the machine or was simply writing about devices common to the period isn't clear. But either way, his description does set a very old precedent for soda machine. After the holy water dispenser, the odd machine popped up here and there - in 1076 AD, for instance, the Chinese invented a coin-operated machine that sold pencils. But like some other great inventions, the vending machine would languish in obscurity for centuries. Charles Hanna, a vending machine historian and author of the book The Vending Industry - History, Trends, Secrets, Opportunities & Scams, said vending machines didn't really start gaining in popularity around the world until the late 1800s. About that time, the Japanese post office started using coin-operated machines to sell stamps while the British used them for dispensing post cards and cigars. In 1887, Stollwerck AG of Cologne set up the first vending machines in Germany to sell chocolates. In the next 10 years, the company would install thousands of vending machines. The machines caught on in the United States, when Thomas Adams Gum Co. started using vending machines to sell its products in 1888. The company placed Tutti-Frutti gum machines in a New York train station, and travelers spread the word about the mechanized wonder. Hanna, of Lenexa, Ka., said that by 1890, a silver dollar in the right machine could buy you a marriage certificate or divorce decree, depending on your mood. Now that's convenience! The first entirely automated restaurant called the Automat opened 12 years later in Philadelphia. The waiter-less restaurant, owned by Horn and Hardart Baking Co., featured rows and rows of food in push-button machines. But those machines didn't make the food, they just dispensed it. Today's vending machines can cook and sell everything from french fries to pizza. The big problem now is keeping the machine stocked and in working order with minimal effort. In 1993, Wired magazine featured a student at Carnegie Mellon University who was sick of walking all the way to the vending machine only to find it out of his favourite soda. So he rigged machine to enable him to e-mail it when he was thirsty and find out what was in stock. CStar Technologies Inc. of Toronto is taking that idea a step further using wireless technology to modernize the machines and make them easier to manage. 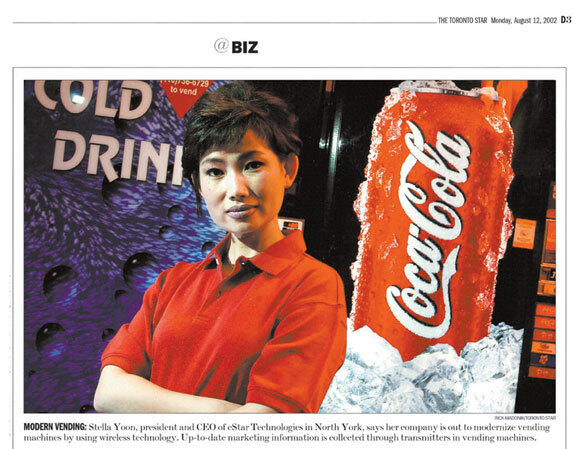 "In the vending industry, people are really servicing the machine in a primitive way," said Stella Yoon, president of cStar. Yoon said one truck driver might have to service more than 150 machines. Each time, he has to park his truck, get out and open up the machine to check for problems, see what needs refilling and possibly change the price. But all that can now be done remotely, using wireless technologies. A transmitter on a vending machine relays information to a receiver and handheld computer in the driver's truck. As the driver completes his route, information from each machine is uploaded to the receiver, notifying him about everything from the temperature inside the machine to how many cans of soda are left. That way, the driver only has to get out of his truck if the ending machine actually needs servicing. And at the end of the day, all that information can be quickly uploaded to a central computer at the head office, saving a lot of time that other wise would be spent on paperwork. "It gives the truck driver a great sense of responsibility, like an IT specialists," Yoon said. "He knows what to take and where." A couple of hundred vending machines in Canada are already equipped with such devices. Vintage and modern vending machines dispense, among many items from left below: bread (1987), fresh air (1960), suntan oil (1989), french fries (1987) and cigarettes (2002).